Independent financial advisers from across Cornwall have joined forces for a new initiative, designed to help people manage their finances more effectively. The scheme, known as “BetterOffCornwall”, is being part-funded by the Partner to Succeed project, which helps businesses grow by collaborating with others. BetterOffCornwall will promote independent financial advice to people who are already financially aware, but may not be making the best use of their assets or income. 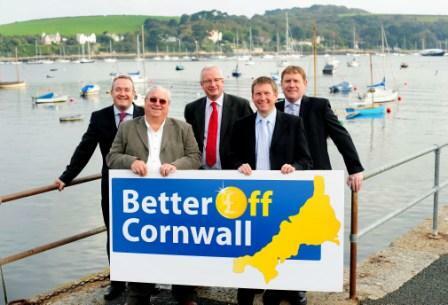 BetterOffCornwall will encourage people to consider a wider range of investments, savings, mortgages and other financial services. Tim Bowcock, spokesperson for BetterOffCornwall, said: “If we can help people in Cornwall manage their finances more effectively, that will have knock-on benefits throughout the economy. Our aim is to help people who are already pretty savvy about money, but perhaps haven’t looked at their investments, income protection or retirement provision for some time. Helen Trudgeon, programme director at Partner to Succeed, commented: “This is a fantastic collaboration because it has the potential to benefit the county in so many ways. By pooling their resources, and with our backing, these independent financial advisers will have the muscle to show how people really can be better off with tailored local advice. The scheme currently includes five firms from across Cornwall; Kelsall Steele in Truro, Rhodri Evans 2Plan in St Austell, iimia John K Miln and Company in Falmouth, 1st 4 Mortgages in Perranporth and Jacksons Financial Services in Penzance.